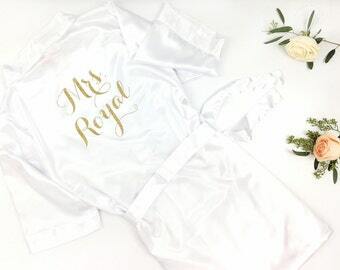 Please enter the Text/Name for the Robe (Ex: "Mrs. Ament") OR If purchasing a blank robe leave "NO TEXT"
*If you leave a name and have selected a Blank robe you will be contacted about an upgrade fee. 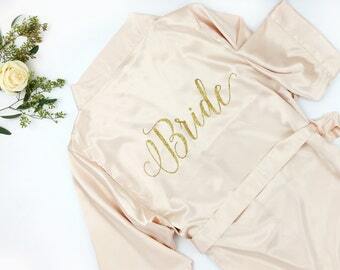 Perfect for Brides and Bridesmaids! 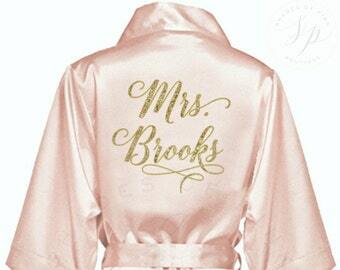 Personalize this Robe with your own Future Last Name or Custom Text! White S/M Robe, 5'7" bride. 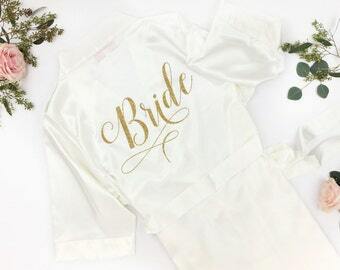 This robe arrives "gift ready" as it is packaged in an organza bag. S/M Ladies size 2-12, Length 35"
L/XL Ladies size 14-20, Length 37.5"
-These robes are meant to fall just above the knee. -Personal suggestion: If you are taller than 5"9 choose the L/XL so that it is not too short. -Smaller, or Plus Size Robes are available on request- please message us! Machine Wash Cold with Like Colors, Gentle Cycle. Do Not Bleach, Tumble Dry Low, Remove Promptly. Expected ship dates: Reference the "ready to ship" times displayed on this listing. "Ready to Ship" times do not include the time for delivery. -If a need by date is not defined, your robe will be ready by the scheduled date displayed on your receipt. Beautiful. I got my best friend the white with rose lettering and she absolutely loves it. It came in beautiful packaging as well. Robe was perfect! It was shipped on time and packaged beautifully!